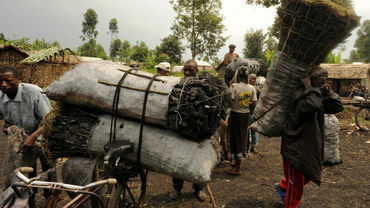 Virunga National Park, home to the worldâEUR(TM)s largest population of mountain gorillas, is plagued by deforestation linked to the production of charcoal for cooking fuel. S&N. Thx for sharing Cal! It is so important to help the impoverished people who live in this area, by distributing improved cookstoves that are more fuel efficient. Many of these people do not have access to electricity, and must cook their meals using wood or charcoal fueled primitive stoves. To save the gorillas' habitat, we need to help the people- they need to feed their children, before they will be willing to help wildlife! Grim but good to know that efforts are being made to reforest and to offer people alternatives. One village resident, Fifi Antoinette — who now has electricity — did not wait for her free electric burner from the Virunga Alliance. “I bought my own,” she said, displaying her sleek store-bought, two-burner cooktop. Thank you for sharing this very interesting article--noted! Solar energy...that's all I have to say! Thank you very much Cal. Thank you for sharing Cal. Thanks for informative article Cal.This is where wealthy countries aid budget could contribute.Win win,Helps the people & helps save the forest too! Why not distribute solar ovens? The world has become such a horrible place. Noted and shared. Thank you Cal.